Next up on the sample docket is First Aid Beauty Face Cleanser ($20) – “Remove surface oils, make-up, dirt and grime.” First of all, this sample was only big enough to 2 uses, whereas I got 4 uses out of the Tata Harper one…lame. Second of all, I didn’t like it. It was very creamy and definitely removed surface oils and make up. However, it never felt like it really cleaned my skin, just sort of wiped off whatever was on top of it. Maybe because it was too creamy? I don’t know, but I would not use it again. After that I tried Fresh Soy Face Cleanser ($38), which promises to gently cleanse, remove “all traces of makeup (even mascara! ),” and hydrates and soothes. 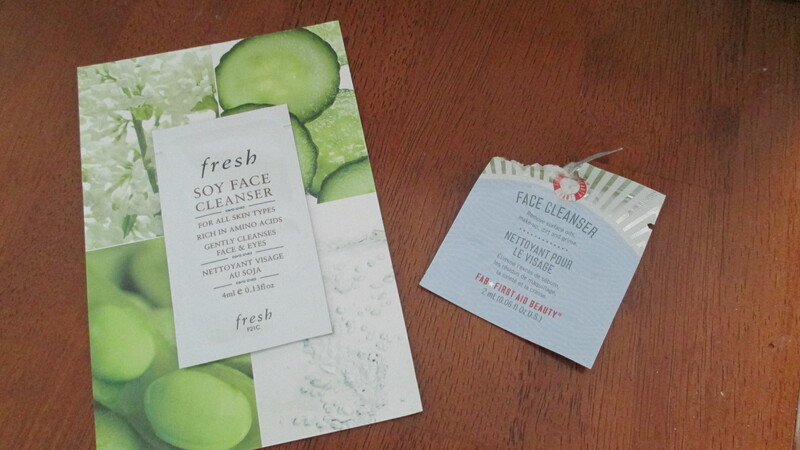 It certainly smells much nicer than the FAB cleanser; like fresh cucumbers and maybe wheatgrass. I think I just made that part up because I’m not sure I’ve ever smelled wheatgrass. Anyway. It’s decent. Smells nice and washes my face. None of these have really targeted acne at all, so I don’t expect them to help with that and, just to confirm, this one is not helping with that, but I still like it. I didn’t realize how much I like the smell of fresh, natural products (both the Tata Harper and the Fresh cleanser). This was especially surprising because I usually use 10% benzoyl peroxide (a dermatologist recommended for me), which in no way, shape or form is natural smelling or looking. I’m going to try to find a benzoyl peroxide topical cream that works okay under makeup (my current one flakes), so that I can use nice smelling cleanser!